The situation is as follows: an article with several authors, each one taking care of a particular section, and the editor that decides to indicate who wrote what through a footnote anchored to the section heading. The problem? If we insert a traditional footnote and then a TOC is created, the footnote anchors that are in the headings will be copied to the TOC! All of them will be duplicated! The challenge then is to get a footnote that only shows on the corresponding heading, not in the TOC. I’ll comment here how to solve the problem “LYX style.” There is a “LATEX style” of solving this problem by defining a new command, but I’ll not talk about it here. In LYX we do not see this instruction, so the short title must be set in a different way: with the cursor inside the title, Insert → Short Title or Alt-A, then 1. Done! Because it’s the short title what goes to the TOC, the footnote will not be copied. This font offers several unique features (specially on the “w,” the “y,” the “z,” and in the dots, that are hexagonal instead of round) that capture the characteristics of Polish writing, but it can be used for any European language without problems. It offers four “weights,” each with its own italic shape. Antykwa Półtawskiego offer “optical sizes,” which means that for taking full advantage of its features it needs to be used with XƎTEX (may I suggest you to use LYX?) or Scribus, because LibO get confused with such a complex font. Originally designed in the first half of the 20th century, this typeface was used in Poland for the publication of music textbooks, in particular for the complete works of Fryderyk Chopin. Now we have its digital recreation with a free license! Sometimes you make your life harder without even realizing it. For years I’ve used regular expressions (there is a detailed chapter about them in my book) to find and eliminate empty paragraphs (among other things: it always amaze me what people is able to drop in their documents) without thinking too much on it. Wrong! There is an easier way to solve the task! This option will eliminate both completely empty paragraphs and those that contains just empty spaces. IIt’s a multilingual font, providing support for Latin, Polytonic Greek and Cyrillic. 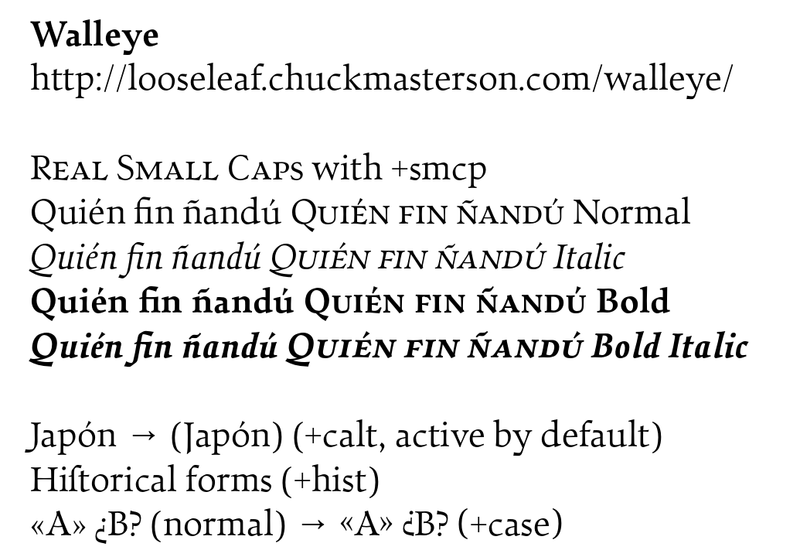 In fact, in addition to the numerous OpenType features presented in the previous screenshots, Walleye offers many option for the different scripts supported (you can check this PDF for more information). A graceful typeface that without renouncing to classical influences (relatively low and “diagonal” contrast, small serifs) provides also many original elements (banner-shaped finials, “open” letterforms). Let’s suppose you want to follow in your RSS reader just a particular tag or category of this or other WordPress blog, not the whole site. I’ll say it from the beginning: I’m not particularly fond of slab serif fonts, specially when they go crazy like those reverse-contrast abominations that even a Western fanboy should hesitate to use on real documents. But there are a couple of slab serif that are not that bad, specially when they are close to “normal” serifs, and they have their use case on low resolution devices after all. Let’s talk about some of them then. Bitstream Charter was originally developed to use on low resolution printers, but remains usable on high quality media too. In 1992 Bitstream donated a version of Charter to the X Consortium under terms that allowed the font to be modified and redistributed. This has resulted in several open source derivatives, including Charis SIL, an OpenType fork of it called Velleka and Michael Sharpe’s XCharter. 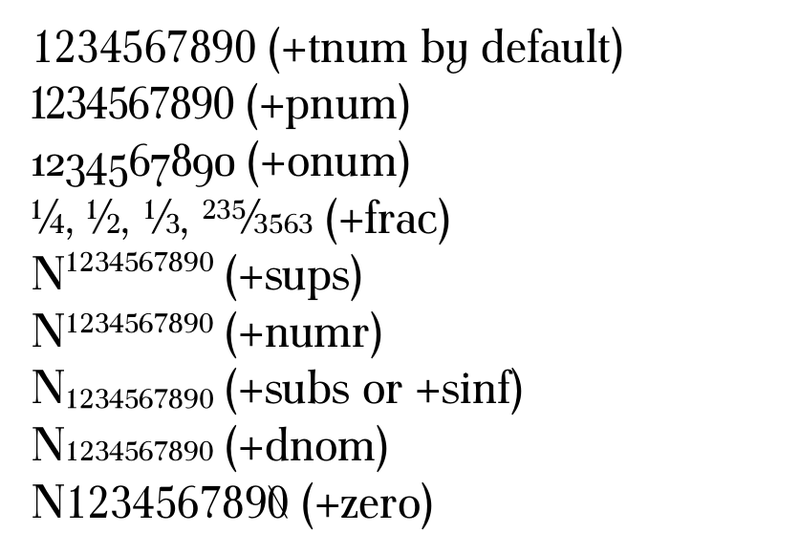 Of all three, the one with the most OpenType features is Veleka: Charis SIL does not offer Small Caps, old style numerals nor sub-superscripts while the other two does, for example, and Veleka is the only one to offer arbitrary fractions. XCharter seems to be the only of the three projects actively maintained. Charis SIL comes on two versions, one with huge default line spacing and the other (named “compact”) with normal spacing. 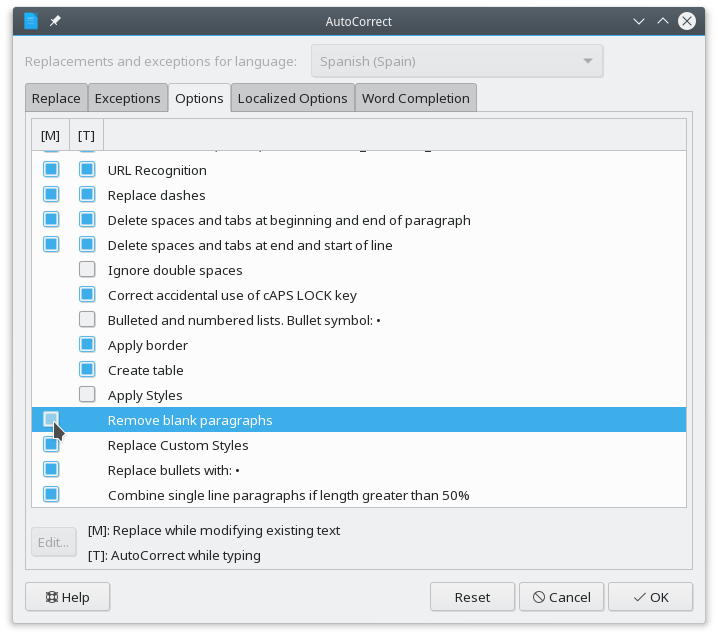 XCharter offers a “slanted” version too, but LibreOffice gets confused by it, so it is either slanted or italic: you cannot use both in the same document. Since I do not like slanted fonts, I simply avoid installing that shape, but consider this issue in Writer. There is no problem with XƎTEX, of course. XCharter includes work (mainly, the Cyrillic alphabet) from another Charter derivative called Khartiya. 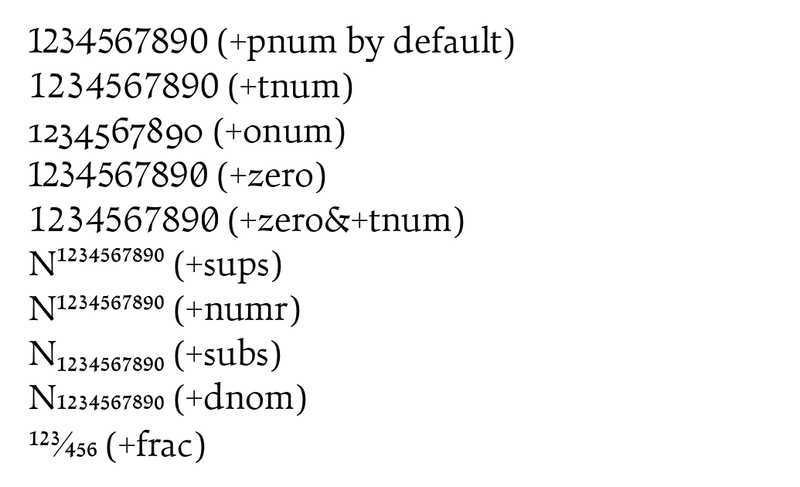 The OpenType feature list of this font is limited (it only offers unicode fractions), but correct, with small caps for all shapes and nice old style numerals. Also, it seems the author is working on a “version 2” that will offer more features. There is another “slab serif” that seems interesting: Besley* from Indestructible Type*, but I did not test it yet. So that’s it: I do not have any other “slab serif” font to share with you, but I believe that the few presented on this article are quite good and I’m sure they will find a place on many documents. And yes, all of them (except Besley*, but I did not test it) are “almost normal serifs,” but that’s as far as I can go: as I said at the beginning, I do not like the extreme slab serifs. The challenge has several parts, so let’s go in order. We can choose any type of image, including vector images (ie, ignore the “bitmap” thing), in addition to selecting the position options on the page, scaling, and so on. When a colour or a background is applied to a page we are actually modifying only the “text area,” that is, if we choose for our page style a background of a certain colour, or a certain background image the margins will be excluded from this configuration. How can we apply a background to the entire page? On the Borders tab, under Padding, type the size of the margins (if you want different “margins” on the four sides of the page, uncheck “Synchronize”). It is not necessary to pick a border, just set the padding. To achieve the “gap” in the text, or a “free” margin, we will have to resort to the drawing tools. By activating the drawing toolbar in Writer we can create a closed figure showing the desired profile. Now we must select the drawing thus created and with a right click → Wrap mark both Page Wrap and Contour to get the text follow the profile of the figure. Now, with the figure selected, we must fix its anchor to the paragraph whose “profile” we want to modify and, in the figure Properties, select a transparency of 100%.